Nell's debut album "Tempus" is available! Sample tracks on the music page, and order it in the store. "Rarely do you come across an album that is so brimming with sincerity, so honest, and so heartwarming, as [Nell] has put together here. If you love lush, folky prog rock, with plenty of nods towards the greats of the 70's, and don't mind a little pop thrown in for good measure, this will be a pleasant surprise for many...chock full of gorgeous vocals, sumptuous Mellotron sounds, majestic piano, gymnastic electric guitar, lush acoustic guitar, flutes, synths, and a myriad of drums and percussion." "This 17-year-old Long Island guitar gal thrice comes close to climbing the pomp heights of ’70s...rock [with] “Tempus” (Yes-like ornateness), “Hunger to Know” (heavy enough to justify its eight-minute length), and “End of Yesterday” (...placid enough to make Espers jealous.)" "An extremely talented young lady spinning some amazing song structures. [Song] 'Hunger To Know'....is simply astounding. Nell is doing what no one of her age and gender has ever tried, and she knocks it out of the park with 'Tempus'." "You want to listen to [Nell's] cover of South Side of the Sky...It's a relief to know she's out there because now none of us have to pretend to be cool any more, as basically this person is much, much more awesome than anyone currently alive." - Paul Ford, ftrain.com, Harper's Magazine Associate Editor & Author and NPR's All Things Considered commentator. 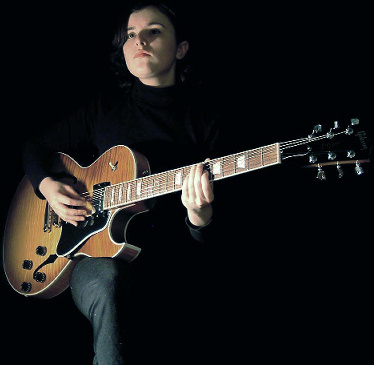 Welcome to the official website of musician Nell James (previously known as Nell & the Nellettes), 18-year-old multi-instrumentalist and composer. Nell released her debut album, "Tempus" (hear samples) in Spring 2006. The album features a selection of all-original compositions loosely tied around the theme of time. The songs show some influence from '70s progressive rock heroes Yes, Gentle Giant and Nektar among others, as well as a dash of favorite indie rock giants the Flaming Lips. Nell produced the album in her bedroom studio, performing vocals, guitar, bass, drums, keys and various other instruments. "Tempus" is available exclusively through the online store. If this website seems out of date, it is because I have turned my attention to other work; primarily composition of classical chamber music (as well as studying for school). My current and future music can be found at my composition website (under a different name, Nell Shaw Cohen). In the meanwhile, I will continue to keep most of this website up for those who are interested in "Tempus" and related music. Happy New Year! In honor of 2007, I've recorded a special new song called "This Is Your Year". I hope you all enjoy it. In other news, my album "Tempus" got a nice review from major German prog site Babyblaue Seiten (my first international review!) and it's being featured on the front page as "Tip of the Month" for January. Also, I've added photos with members of Bill Bruford's Earthworks in the scrapbook. Today my album Tempus was/is featured on ProgPositivity radio; tracks from the album are being played every hour. Thanks to DJ Mark Stephens! I've just posted my cover of Gentle Giant's "On Reflection" on the other music page, as well as "She Gave Me the Sun" by Simon Dupree & the Big Sound. There's also a new photo with Gentle Giant guitarist Gary Green in the scrapbook. "Tempus" just got a fantastic review from one of the biggest progressive rock sites on the net, Sea of Tranquility! It's featured on the front page as CD of the day. I've also added the title track "Tempus" as a free download to the music page, and added a press page. I'm featured on The Morning News' "Mp3 of the Week", as well as Internet radio show the BZT Weekly with Jeff & Jenny (episode #157). My album "Tempus" has been reviewed by Harp Magazine, a major music journal. I'm reviewed alongside Stereolab, Yo La Tengo, Joan Jett and Johnny Cash! Read the review online. Subscribe to my mailing list to receive only the most important announcements regarding my music and this site.